The workers of Philip Morris-Fortune Tobacco Corp. (PMFTC), the leading cigarette manufacturer in the country, are preparing to strike in response to the mass layoff in its Marikina factory and the shutdown of its Vigan plant. The Philip Morris-Fortune Tobacco Corp. Labor Union (PMFTCLU-NAFLU) today filed a notice of strike over the termination of a third of the workforce of the Parang, Marikina factory and the closure of the Vigan, Ilocos Sur tobacco redrying plant. 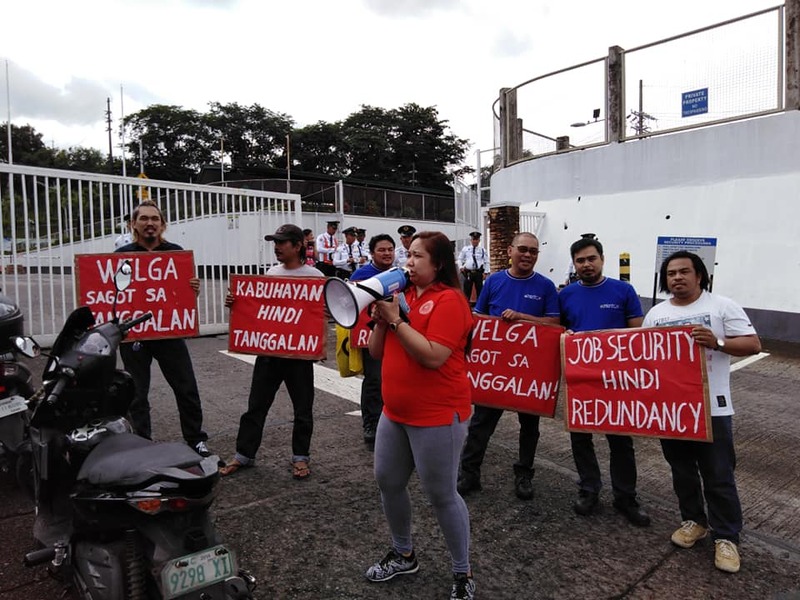 “PMFTC is highly profitable and workers have met the key performance indicators so why are 90 union members in Vigan and another 220 in Marikina being retrenched? After being productive and efficient, workers are now being made to sacrifice? What kind of system is this?,” argued Rene Magtubo, chair of Partido Manggagawa and former president of the Marikina union. Both the Vigan and Marikina plants were closed since yesterday and no employees were allowed to work. The union held an emergency mass meeting yesterday that was attended by a majority of the work force. A protest at the Marikina factory gate was launched after the assembly. Today, a morning and afternoon picket-protest was again held. The PMFTCLU is alleging unfair labor practice over the closure and retrenchment. The union slammed the bad faith and deceit attending the so-called right-sizing plan of management. The group believes that union busting is the real agenda as the non-union sister factory in Sto. Tomas, Batangas just regularized 100 contractual employees. In contrast, the Marikina and Vigan plants are both unionized factories. “We express support for the fight of PMFTCLU for job security and against union busting. Ang laban ng isa ay laban ng lahat,” declared Gerry Rivera, president of the Philippine Airlines Employees Association (PALEA-TUCP) and head of the newly formed Kapatiran ng mga Unyon at Samahang Manggagawa. Both PALEA and PMFTCLU are members of the Kapatiran. “Management told the union that the Vigan plant will be closed and sold to another entity. No other details were given. This raises the suspicion that this is another outsourcing program similar to the contractualization scheme at Philippine Airlines,” Rivera insisted. “PMFTC management has been absolutely opaque behind the misnamed right-sizing plan. When management first discussed the plan before the union two days ago, they withheld the names of workers affected, they did not disclose how the termination process will proceed and finally they did not give any solid basis for the closure and redundancy. And then just hours after the meeting with the union, management unveiled its surprise gift to unsuspecting workers who were cajoled into signing separation without the presence of union officers who barred from entering the factory,” Magtubo elaborated.